Is Psychopathy A Virus? The Watiko! Why Are Aliens Abducting Humans? Music, Myth, Cosmos . . . Musical Tones and Teleportation? The Synchronisity Of The WHO and The Matrix, how albums synchronize with movies, and Accidental Initiations. Hour 1: Alex Robinson. Is western society trauma based? From birth to school, work to death, life is deemed rather traumatic and it stops people from progressing into new and exciting areas of thinking and socializing. Have adults forgotten the true meaning of play time? How much can we learn about how to be happy from simply observing the habits of children, play, explore and be curious. Hour 2: Alex Robinson with Alan Abbadessa Green. Excellence in life is certainly not assured, what works for one may not work for someone else, it is important to find your own path through life and allow yourself to be open to new ideas and possibilities just in case you missed something. Isn't it interesting if you try to regress your thoughts back by repeating the question "How did I get here?" you somehow trace back to a really profound realization that blows your mind? Is the Moon the most powerful influence on our minds? Is there really any new ideas under the sun at all or are we just reinventing what has always been done? An extremely entertaining and informative show, it's not every day that you get to delve into the nature of reality itself and return on the other side unscathed and enlightened. Consciousness can change reality almost as much as reality can change your consciousness, the universe is a huge place with many unexplained phenomenon. Why is it that men can't find anything in the fridge? How is it possible for people to move from one location to another seemingly instantaneously? Why is consciousness within the human psyche understanding that which science cannot explain? How much cartoons and movies have you seen over your life? Read any comics? How much of that fiction became reality later on? An interesting discussion about the nature of predictive programming and why science fiction isn't necessarily fiction, but in fact based on real occurrences and in some cases accidentally come up with new inventions, or new visions for the future of humanity. Why you should value your experiences in life and try to learn something from them, don't take yourself too seriously, listen to criticism, curb your ego & remember to laugh. The universe works its magic on your life so long as you're doing the right thing everything you need will turn up at the last possible minute and you must trust it. A truly inspirational broadcast. Numbers & architecture, lay lines and strange coincidences, the occult & sacred geometry, topics which are often shrouded in mystery, interpretation and emotional people who see a meaning in everything. Now it's time for the facts, number sequencing, the numbers 33, 666, 555, 432 and much more, it's quite amazing to notice how much of the earth, the moon, the sun and indeed the universe seem to be built upon mathematics of this nature while man is largely unaware of it, and even when becoming aware, possess a lack of understanding on why these interesting phenomena exist. So if we let go of our assumptions and just go back to the data and evidence, it teaches us to remain open minded and welcome possibilities whatever the implications might be. The world is both physical and metaphysical, not one or the other, you can either move a chair in 2 seconds or study to be a telekinetic monk for 60 years and then move the chair. We must take some responsibility and be aware that meaningful coincidences in life are extremely important to how we interact with other people and the world itself. A revealing and insightful interview on the nature of psychedelics and intellectual evolution. Frater X, a member of many Occult secret societies, has spent a good portion of his life accessing the archives of these secret orders, reading 200 year old books with dust all over them, to compile one of the most revealing and comprehensive historical accounts of war going on. A war carried out by the Scottish rite of freemasonry, to dominate all the other various masonic orders. 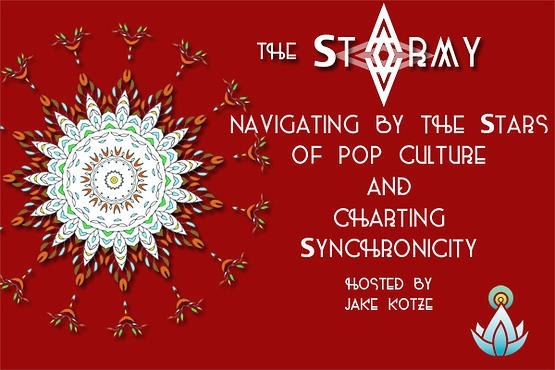 The StArmy is an “entertainment” show hosted by Jake Kotze investigating current and forthcoming films via sync. Movies and their stars contain alignments with each other, current world and astronomical events as well as continuing sync themes investigated by a community of like minded individuals on twitter, blogs and in sync videos. Watching a movie with this new context and understanding becomes a powerful ritual plugging us into each other and the source of all creation. Tools of The StArmy include trailers, star birthdays, posters & film clips, scoured for patterns that vivify the seamless web of existence; a union that is relevant and true for all facets of our lives. By removing the barriers between things with sync our minds become hearts and shine with joy. There is a contagious psychospiritual disease of the soul, a parasite of the mind, that is currently being acted out en masse on the world stage via a collective psychosis of titanic proportions. This mind-virus—which Native Americans have called "wetiko"—covertly operates through the unconscious blind spots in the human psyche, rendering people oblivious to their own madness and compelling them to act against their own best interests. Drawing on insights from Jungian psychology, shamanism, alchemy, spiritual wisdom traditions, and personal experience, author Paul Levy shows us that hidden within the venom of wetiko is its own antidote, which once recognized can help us wake up and bring sanity back to our society.